Festo is one of the world’s most prominent engineering companies and a market leader in technical training. For their new AutomationCenter in Southern Germany, Festo along with an interdisciplinary team of engineers, developed an innovative single-skin building envelope which features an “air-exhaust facade principle.” Rather than applying louvers and fins to the glass building, this system employs the use of an automated interior solar shade. Festo has already made a name for itself, writing a new chapter in industrial architectural history by applying new pneumatic multi-layer foil roofs and lightweight glass-cable facades. 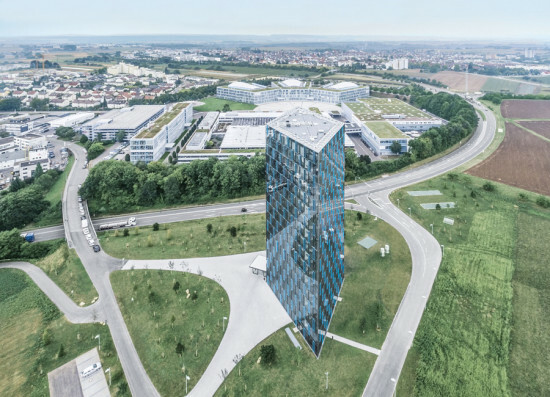 A 67-metre-high, full glass, diamond-shaped office building is the first component of a new company campus. A reinforced concrete structure, consisting of 16 floors and two basements, is placed on five supports. 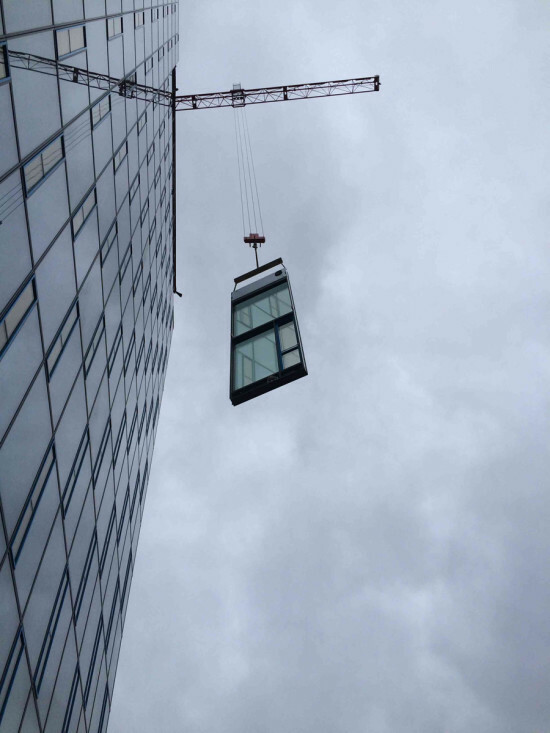 Two shafts with glass lifts provide further stability in the pointed corners. The office spaces are located in the middle of the stories. Striking the balance between EnEV compliance and a user-friendly full glass facade was only possible with an intelligent new system. The cooling load of the building was prioritized early on in the design process due to heat from the interior along with solar radiation. The design team produced a concept to shield the sun using an inside glare-protection screen. Between this screen and the exterior envelope is a ventilation channel through which waste air is exhausted. 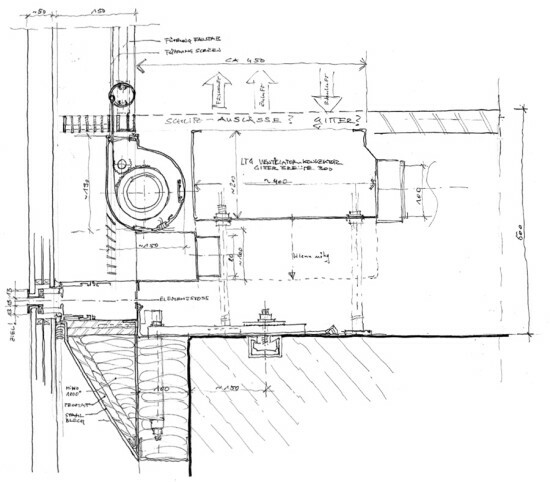 The cavity is fed also through ceiling plenums where exhaust air from the offices is expelled. This space functions as an insulated buffer – heat from the sun is absorbed by the inside solar screen and routed up through the cavity. At the same time, the surface of the screen which faces the interior is virtually room temperature. The inner glare protection screen is rail-guided, and operates dependent upon the quantity of solar exposure in the space. The material is light and translucent, helping to provide filtered daylight with low glare. The whole system can also be custom-controlled. 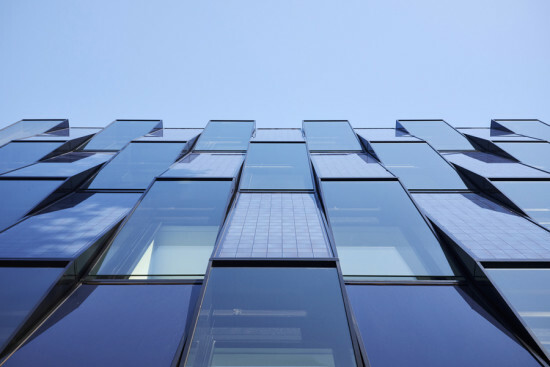 The result is a weatherproof envelope and a facade system with a dynamically adaptable solar energy transmittance. 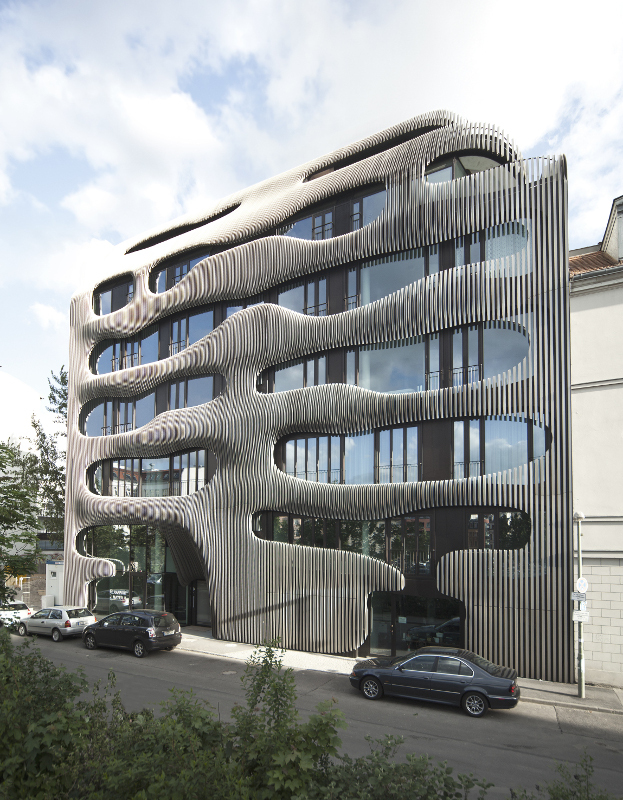 Andreas Beccard, Senior Projects Manager for Priedemann Buildings Envelope Consultants, told AN the success of the project was possible due to an interdisciplinary team. “The commitment of the whole team becomes obvious when looking into the development process of the active blind air-exhaust façade. Only thanks to complex simulations and a façade mock-up and its detailed in-situ measuring the façade system became feasible.” Facade-Lab and the Fraunhofer Institute for Building Physics in Holzkirchen carried out a series of mock-ups to experiment with material fabrics, air flow, and user comfort criteria. The findings produced a reduction in the energy required for cooling of 10-30% compared with a standard building, depending on its size and air-exchange rate. The system has been in operation for nearly one year (completed July, 2015). Even as exterior temperatures have reached over 100°F, the room temperature remains at a constant mid to upper 70’s, saving energy required for cooling the space, and providing a consistent environment for user comfort. 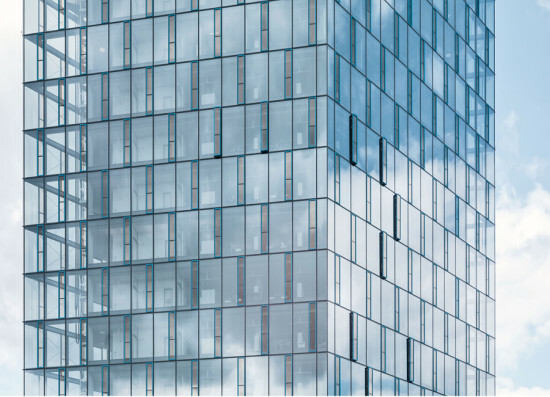 Since completion, this “air-exhaust” facade technology has been adopted for a second project – a retrofit of the old ECB high-rise in Frankfurt. 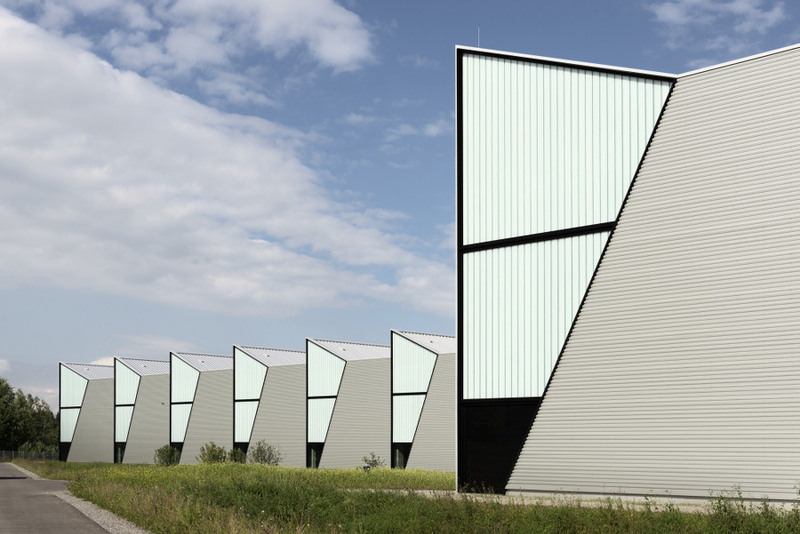 Kadawittfeldarchitektur (KWA) has built a modern energy efficiency center on the campus of Hochschule Niederrhein in Mönchengladbach, a city in North Rhine-Westphalia, Germany. 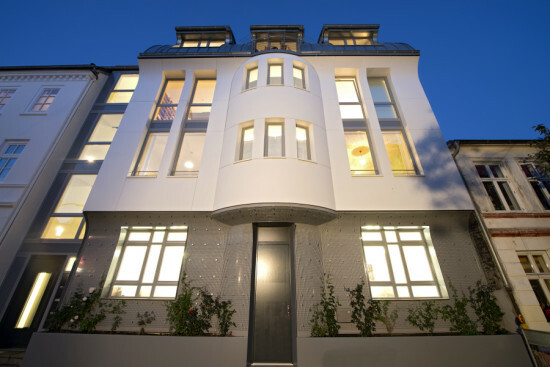 The zero emission building is constructed to Passive House standards which require thermal bridge free design, superior windows, ventilation with heat recovery, quality insulation and airtight construction. The driving idea behind the project was to unite the science and energy industry with the university in a collaborative effort to share innovative energy technologies with the public. The building accommodates an energy center for NEW, an energy and water utility company, along with an academic library, a startup center for new business ventures, and an energy laboratory for students.